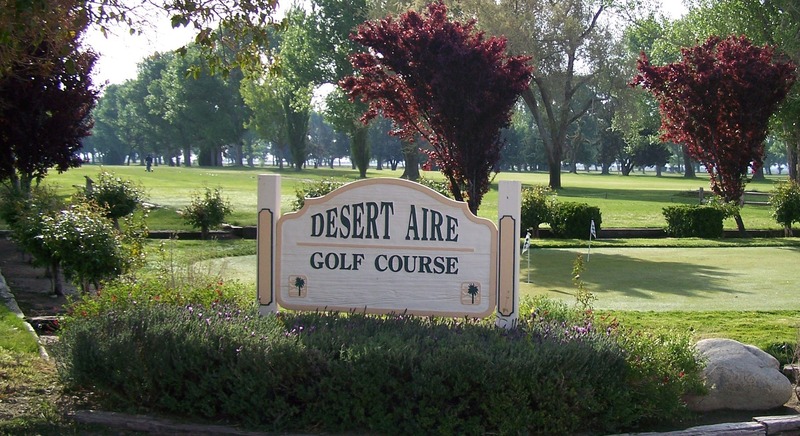 Desert Aire is a full length 9 hole course with tree lined fairways. You can see our gigantic majestic cottonwood trees for miles! A great place to learn or hone your skills with the friendliest staff and golfers in town! The course length is 3178 from the blue tees. sand bunker, a practice putting green and a large practice chipping green area. You can relax and watch the Golf Channel in our clubhouse restaurant where we offer hot dogs, sandwiches, burritos, philly cheesesteaks, snacks, soft drinks, beer and wine coolers. All while having fun in a relaxing environment! Juniors play for FREE with a full price paid adult or another paying junior everyday after 11am!! Our mens club plays Wednesday mornings and our ladies club plays Thursday mornings. Visitors are welcome and encouraged to join the clubs. Our ladies and mens club golfers are friendly and helpful. We also have a very friendly group fondly called the "Divot Diggers" that play every Monday and Thursday morning. They play a friendly scramble for the first 9 and if you want more, you can join them for a skins game for the 2nd 9 holes! Open to all! We also have a very friendly skins game every Wednesday afternoon and Saturday morning! All the groups get a discounted green fee and cart fee, so you could not only win some $$ but you can save $$ on your fees as well! Please call the pro shop for more information if you are interested in coming out to play or would like to speak to the ladies or mens club presidents. Great Golf & Great Value for the Whole Family! JOIN OUR E-CLUB FOR MONTHLY SPECIALS!